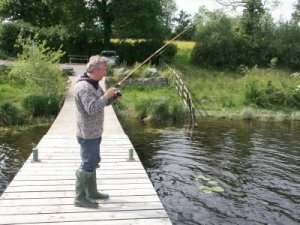 The Erne-Shannon complex, including rivers, canals, lakes and the big Loughs, of course would take a lifetime to fish and explore. That means we can only just scratch the surface here. There are literally thousands of places to fish en route from Ballyshannon to Limerick and beyond. Most of the waters under this heading would not attract the game angler, pike, perch, rudd, roach and bream are the dominant species here. And not to forget, the eel. Carrick-on-Shannon is regarded as one of Ireland's coarse angling centres. Apart from the River Shannon itself, there are 41 lakes. The river is stocked with bream, rudd, roach, tench and pike. Fishing can be pretty good right in the middle of town. It is an ideal centre for the visiting angler with good fishing, entertainment, forest walks and boating readily available. On the Shannon big bags of roach can be caught at Battlebridge, Hartley, Jamestown and Drumsna, not to forget downtown Carrick itself. Lough Aduff and Tully are noted for large tench up to 7 lbs. Carrickport Lake, Lough Bran and Bog Lake boast big shoals of bream. Roosky is a village on the river Shannon and a well known angling and boating centre. The River Shannon and its tributaries, the Rynn and Eslin rivers together with Pigeon Island Bay (on the Shannon) Bog, Gortinty, Cloonboniagh, Rynn and Aduff lakes are the most popular waters in the locality. The main species to be caught are bream, pike, roach, perch, rudd, eels and tench as well as brown trout. 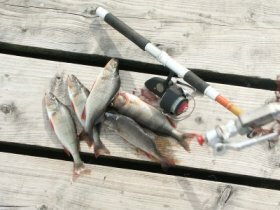 Bream catches of 800 lbs, 300 lbs, 160 lbs and 100 lbs have been recorded in the locality. Lanesborough is located at the head of Lough Ree. According to legend Queen Maeve was killed on an island here, before she was buried on Knocknarea near Sligo. And, Lough Ree has it's own monster. Not as famous as Nessie, but all the same. When my memory serves me right, it was spotted last in spring of 1960. There you are.